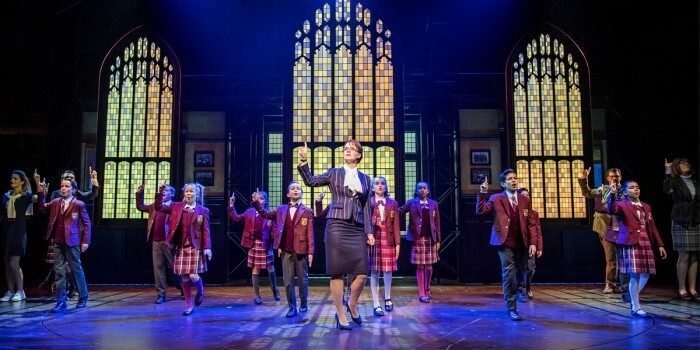 Before school’s out for February half term, Andrew Lloyd Webber announces that he will enroll a new class of kids to the Olivier award-winning School of Rock – The Musical on 24 February 2018. The ‘kids’ cast comprises Santiago Cerchione, 13 years old from London, Oscar Rice, 11 years old from London, and Phoenix Taylor, 12 years old from York, who will play Zack; Jasper Bew, 10 years old from London, Annabel Gracey, 12 years old from Bradford, and Stanley Jarvis, 12 years old from London, who will play Freddy; Gus Graham, 12 years old from London, Alfie Humphreys, 11 years old from Buckinghamshire, and Austin Kindler, 11 years old from London, who will play Lawrence; Anya Cooke, 10 years old from Bristol, Amelie Leatherland, 12 years old from Brighton, and Audrey Newman, 10 years old from London, who will play Katie; Jarvis Baugh, 12 years old from London, Liam Hewitt, 13 years old from the West Midlands, and Jensen York, 11 years old from Warwickshire, who will play Billy; Anya Hewett, 10 years old from County Durham, Aaliyah Monk, twelve years old from Suffolk, and Freya Yates, ten years old from Sheffield, who will play Summer; Natahlia Colbourne, 11 years old from Kent, Fayth Ifil, 10 years old from Swindon, and Aaylia Rose, nine years old from London, who will play Tomika; Rayyan Chihi, 12 years old from London, Hugo Dunkley, 11 years old from London, and Jack Gale, 11 years old from Hertfordshire, who will play James; Heather Clementson, 11 years old from Hertfordshire, Romanie Jija-Wakeham, 10 years old from London, and Grace Wood, 12 years old from Surrey, who will play Marcy; Daniel Luniku, 11 years old from London, Charlie Vyacheslavov, 13 years old from Berkshire, and Jeremiah Waysome, 11 years old from London, who will play Mason; Vanecia Salam, 11 years old from London, Tia Stuart, 11 years old from Kent, and Shaye Temple, 10 years old from London, who will play Shonelle; Zoe Coleman, 11 years old from London, Frankie-Mae Garner, 11 years old from Essex, and Darcy Snares, 11 years old from Essex, who will play Sophie. The UK wide search for the chance to ‘join the band’ continues! More open auditions are set to take place later this year in Bristol on 10 March and 21 April in Leeds on 21April with dates to be announced for London, Manchester and Plymouth. If you are 8 – 12 years old and play a rock instrument (guitar, bass, piano, and/or drums) or sing, registration and further details can be found by contacting Jessica Ronane Casting at rock@jessicaronane.com or at www.schoolofrockthemusical.co.uk/auditions. Continuing in the West End at the New London Theatre, School of Rock – The Musical is currently booking to 13 January 2019. Book School of Rock – The Musical today! The show is also currently participating in our New Year Sale until 9 February.